Sunset Lodge, our 'Mountain Home' is a beautiful custom built 5000 square foot private house with three levels and vaulted ceilings. Our home is located near the top of the ridge on Solamere Drive in the Lower Deer Valley area. One of the few houses in the Solamere area with spectacular sunset and down valley views. You will end your day of skiing, snowboarding, hiking, or mountain biking enjoying the fantastic sunset view from the front balcony deck off of the timbered Great Room. Then relax in the large hot tub on the extended outside deck overlooking the Park City Valley. In the late summer and fall you will see the colorful array of leaves turning yellow, orange and red across from Sunset Lodge on Masonic Hill. You can just walk or bike from Sunset Lodge to a number of hiking and biking trails. Our NON-SMOKING, NO PET four bedroom home is perfect for an extended family reunion or vacation for up to up to THREE couples and additional SMALL children to a maximum of twelve or FOUR couples without children who want the privacy of their own house. If you want to book more than three couples with children, all of the children will need to sleep with the one or more adult in the bunk room. Sunset Lodge is set up for a maximum of 6 adults and additional children under the age of 12 or 8 adults without children. You are a little over one mile from the main Snow Park Lodge at Deer Valley, just over two miles to Park City Mountain Ski Resort and two miles from Historic Park City's Old Town Main Street with many great restaurants and interesting shopping. The Park City Mountain Ski Resort now includes Canyons to make the largest ski resort in the USA. You fly into the friendly Salt Lake City International Airport, pick-up your rental car, and you can be at Sunset Lodge in 45 minutes unless you stop to make purchases on your way through Park City. Concierge Services are available, if desired, to pre-stock the kitchen and house, make advanced reservations, or decorate the house for special occasions and holidays. 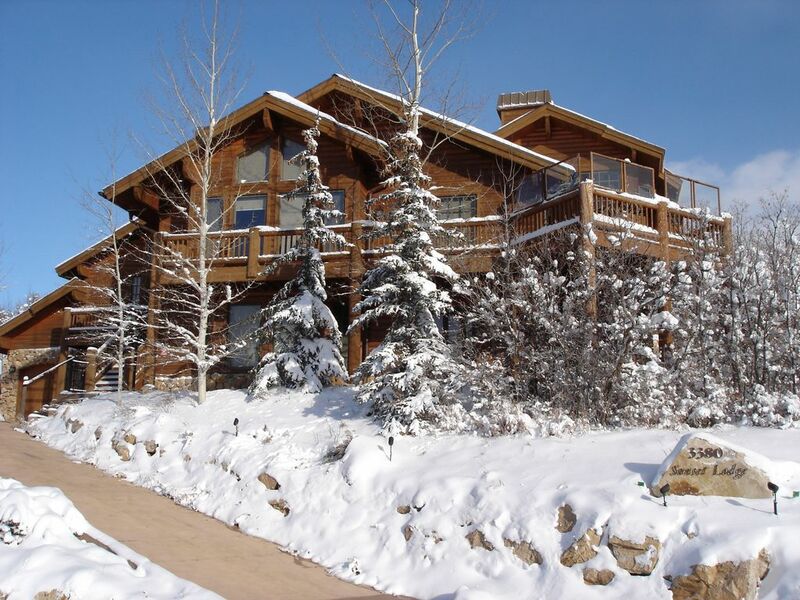 Sunset Lodge is located on a quiet drive with little traffic in an exclusive area of Lower Deer Valley. The driveway from the street to the house is heated. There will not be a snow plow on the driveway at 6:30 in the morning and there will not be accumulated snow or ice on the driveway after a 'white-out' day of skiing and/or snowboarding. Deer Valley ski resort offers complimentary ski storage at Snow Park Lodge so there is no need to carry your skis to the car at the end of the day - unless you plan to ski one of the other great Utah resorts within easy driving distance. Park City Mountain Ski Resort including the Canyons area is just minutes away. Solitude and Brighton are located in Big Cottonwood Canyon. Alta and Snowbird are in Little Cottonwood Canyon. All four resorts in both Cottonwood Canyons are an hours drive away. Snow Basin ski resort is an hour and 15 minutes drive. Powder Mountain ski resort is an hour and 30 minute drive. We have an efficient forced air dryer for six pairs of boots AND six pairs of gloves in the ground floor entry area so wet boots and gloves will never be an issue when you spend your skiing/snowboarding vacation at Sunset Lodge. The entire house has a beautiful, spacious open floor plan with comfortable furnishings. On the main level enjoy the Great Room with vaulted ceilings encompassing the all granite gourmet kitchen with separate prep sink/wet bar, large dining area, 46 inch HDTV, wood burning fireplace and a telescope to enjoy the 'down valley' view overlooking Park City. The dining area opens onto the front deck with the hot tub and fabulous views. The separate Entertainment Room includes a 60 inch Smart HD television with xfinity X-1 cable box including DVR, 80Gb PlayStation 3 with 2 wireless Dual Shock controllers, game table, rear deck and great views. The PS3 is a Blu-ray DVD and regular DVD player with Sony Blu-ray remote. The main level master suite includes a gas fireplace, Smart HDTV, and DVD player. You can walk directly onto the front deck and hot tub area from this bedroom. The upper level has a sitting area for quiet reading and another master suite. In this master bedroom you have a gas fireplace, HDTV, DVD player along with a seating area. Both master bathrooms have large jetted tubs, stall showers and dual vanities. The lower level has the queen bedroom and the bunk room. The queen bedroom has an HDTV and DVD player. The bunk room has a flat screen TV, DVD player and a compact stereo system. All four bedrooms have en suite bathrooms, walk-in closets and there is a powder room adjacent to the Great Room on the main level. The lower level has another living space with a gas fireplace, a regulation pool table, and an desk area including a 3 in 1 printer, copier, and scanner for your use. If you must work while on vacation this will make it convenient to set-up your notebook computer and take care of business. Hard wired or passphrase security protected high speed wireless internet is included through out our home. One of our property managers will greet you. We ask that you call from the airport so they can be prepared for your arrival. They will already have freshened the house, arranged for any special needs you have requested, turned up the radiant floor heating and adjusted the temperature in the hot tub in anticipation of your stay. They will show you how everything works, give you the keys and garage door openers, and then leave you to enjoy your vacation. They are locals and are always available to assist with any questions or problems that could arise during your stay at Sunset Lodge. You will not be stranded by distant management. Then contact our property manager on the day before your departure and they will meet you at the house to see you off, lock-up and check-in the keys and garage door openers. They will perform a thorough inspection of the property and arrange for the housekeeper. They report any damage, breakage or smoking to us. Sunset Lodge has 24/7/365 monitored smoke and carbon monoxide detectors. Sunset Lodge is a "no outside shoes inside" home. During all seasons, all exterior shoes are removed on the stone floor inside the front door and the door from the garage in our entry area. You will bring your comfy flip-flops or slippers for inside wear. Bare feet are good also. The radiant heat floors throughout our home will keep your feet warm. Keep a pair of outside shoes by the door to the deck to access the hot tub. Mid-week housekeeping or daily maid services are available for an additional fee. Call for 'last-minute' rental opportunities. Minimum age for primary renter is 30 years. Cancellations: If more than 60 days before arrival date full refund; 60 days or less before arrival date, renter will receive no refund unless the house can be re-rented for same terms, less a $250.00 fee. Refundable Security Damage Deposit: The $1,000.00 Security Deposit is refunded after our Property Manager and Cleaning Service has serviced the property following your departure unless there is unusual damage. Please be sure to include on the email inquiry form the number of adults, number of children and a telephone number where we may contact you prior to confirming your rental. We also have 3 vacation rental properties in Islamorada, Florida, the Florida Keys. Please visit www.VRBO.com/809744; www.VRBO.com/745651 and www.VRBO.com/1174114. We grew up in Southern California and were fortunate to enjoy both mountain and oceanside activities. We now live in the Florida Keys. We both love sunsets. Our goal was to be able to retire with a mountain home and a oceanside home. 'Sunset Lodge' is our Deer Valley mountain house with a spectacular sunset view 'down valley' overlooking Park City. We also have a Florida Keys house, 'Sunset Reef,' with an equally fantastic sunset view. We are blessed in life with great family and good friends. The photo is from the Park City Jazz Festival; a wonderful event that we supported. Deer Valley is a great location for a winter 'ski' house and a summer 'hiking/biking' house. You cannot beat the convenience of flying into the Salt Lake City International airport and being at our home in under an hour. Deer Valley ski resort is a little over one mile away and there are a number of fabulous ski resorts within easy driving distance. The summer hiking and biking is unmatched in our opinion. We fell in love with the fantastic views of the surrounding mountains and the Park City valley. Enjoying the fabulous deck to look 'down valley' over Park City is wonderful, especially at sunset. We enjoy music and have a nice stereo system with speakers in a number of the rooms and on the decks. There are many ways to relax in our mountain home. Park City was a mining town long before it became a ski resort destination. Historic downtown Main Street is located 2 miles away. Original, restored buildings remain with shopping and restaurants. Snow Park Lodge at Deer Valley ski resort is a little over a mile and Park City ski resort which includes Canyons is a little over 2 miles from Sunset Lodge. Spectacular sunset and down valley Park City views including the surrounding mountains are the vista in front of the house and from the deck. Deer and moose are frequently seen from the house. Free local and nationwide long distance service. Please use the provided telephone service to report any emergency calls. This will provide the first respoders with the address. Radiant floor heating through out Sunset Lodge maintains a constant comfortable temperature. There is no forced air system to further decrease the humidity. Humidifiers are provided if necessary. Fine fitted linens for all beds. Full laundry room with full sized washer, dryer and sink. There is a wood burning fireplace with chimney fan in the Great Room. There are gas fireplaces in the two Master Bedrooms and the Pool Table Room. Two SUVs can park in the garage. The driveway is automatically heated so that snow or ice never accumulates. Any additional vehicle must park on the driveway close to the single garage door. There is an attached garage with automatic openers. The garage easily accommodates 2 large vehicles. Additional off street, driveway parking is available all seasons. Comcast Wireless Gateway with password protected WI-FI throughout Sunset Lodge. Fluffy bathroom towels. Make-up removal towelettes and brown wash cloths are provided for make up removal. Hot tub towels are provided in the lower cabinets of the Great Room corner stereo cabinet. Great Room with vaulted ceiling, wood burning fireplace and 46 inch HDTV. Separate Entertainment Room with 60 inch HDTV, DVR and PlayStation 3. Sub Zero refrigerator/freezer in the kitchen and an additional refrigerator/freezer in the garage for your use. 5 burner gas cook top. Fully stocked spice cabinet. Baking materials are in the pantry. Full dining service for 16 including white, red and sparkling wine glasses. Nice dining area with large table and 10 matching chairs. Enjoy the adjacent wet bar/eat-in area at the large pine and granite island. The Entertainment Room has a 60 inch Smart HDTV. The Great Room has a 46 inch HDTV. Both Master Bedrooms, Queen Bedroom and the Pool Table Room have HDTVs. The Bunk room has a flat screen TV. All TVs have Cable receivers. The HD TVs have HD Cable receivers. The HD TVs all access the DVR functions of the xfinity X-1 Cable system. Stereo system is located in the corner cabinet in the Great Room. 5 disc CD player, iPod/MP3 connection, and AM/FM. Speakers on both exterior decks, Great Room, Pool Table Room and top master bdrm. All bedroom TVs have attached DVD players. The Entertainment Room has a 80 GB Sony PlayStation PS3 that plays both blu ray and regular DVDs. Collection of books in the Entertainment Room, Top Floor Master Bedroom and the Pool Table Room. Collection of board games, cards, etc. in the Entertainment Room cabinets. Collection of CDs are with the Great Room stereo system. Regulation Pool table in ground level Family Room. Basket of children's books. Bin of toys and children's items. A few DVDs are in the Entertainment Room cabinet. Bring your favorite DVDs. Two mountain bicycles, tire pump and helmets are available for your use. You must ask for their use before arrival so our property manager can unlock and add the equipment for your use. The house has three Main Level balconies/decks. One surrounds the Great Room overlooking sunset and the Park City Valley including the hot tub and a table with 10 chairs. There is also a small front deck and a rear deck off of the Entertainment Room with an umbrella table for 6. The eight person hot tub on the extended front exterior deck overlooks the expansive view down valley over Park City. On the day of your arrival, our property manager will heat the hot tub. He will show you how to adjust the temperature and use the jets and air blower. The driveway is heated to prevent snow and ice build-up. There will not be a snow plow in the driveway at 6:30am ever. The driveway will be clear after a "white out" day of skiing. The stereo system is located in the Great Room cabinet with a 5 disc CD player, AM/FM radio and iPod/MP3 player cable. The speakers are separately controlled for each room so you can choose which room's speakers are activated. The speakers are located in the Great Room, lower level Pool Table room, top floor Master bedroom, the outdoor Hot Tub deck and the rear deck. A forced air six pairs of boots AND six pairs of gloves dryer is inside on the lower level. There is radiant floor heat throughout the entire house. You will not be inconvenienced by a forced air heating system that decreases the humidity inside our home. Humidifiers are provided for all bedrooms and the Great Room. Sunset Lodge is a perfect vacation home. It is very spacious, luxurious and welcoming. The sunrise and sunset views from the large windows are amazing. Deer Valley, Park City Main Street and Park City Ski Resort are just minutes away. We enjoyed cooking meals in the well stocked kitchen, relaxing in the hot tub after skiing, and spending time together playing pool or lounging in front of the fireplaces while listening to music on the whole house speaker system. The house is exactly as shown in the pictures and descriptions and we highly recommend this amazing home to families and groups. Great for a big family or group of friends with kids. Lots of baby/toddler gear. We would definitely return and recommend to friends! Fantastic home overlooking Park City. There wet 8 of us visiting for Thanksgiving including two young children. We had an amazing time at house. It was very spacious with nice open space to gather and socialize. We also took advantage of the hot tub on the deck after a day on the slopes. The home was well stocked with everything we needed for our thanksgiving meal preparation. The owners were great to deal with throughtout the process as was the property manager when we arrived. Would highly recommend Sunset Lodge to anyone looking to visit Park City. The property managers were solid. They were willing to fix any problems that showed up even though they lived 1/2 hour away. They also recommended a great Weber River guide in Clark Gallo. The place is super nice because the owners actually live there during the parts of the year. The views are great. Fun to see the deer in the yards occasionally. The rental is close to a lot of activities. Thanks so much. This house was perfect for us -- <5 minutes from the base of Deer Valley and close to Main Street; it had the BEST views; and it was nicely laid out to accommodate our large family. On the latter point, the house had 3 distinct living areas and 2 masters (in addition to a large bunk room and another guest room) so plenty of room for our large group (6 adults; 2 kids). The house was also very organized, and the kitchen was very well appointed. It is also very kid-friendly with an available crib, high chair, stroller and children's books. We would definitely rent this house again. The owners were also very responsive to our emails/questions. Highly recommend!! Sunset Lodge was the perfect place for our family vacation. It is a beautiful home and is just as spectacular as pictured. It is close to all activities (downtown Park City, tubing, skiing, skating), but also was the ideal place for us to enjoy just staying home in front of a fire on a snowy evening. I highly recommend Sunset Lodge and look forward to staying there again in the future. Rates are subject to change until reservation is confirmed. Approximately 50% of our guests return yearly. Current vacation guests have the first right of refusal for the same rental period in the following year. Cancellations more than 60 days from arrival date receive a full refund. Cancellations less than 60 days from arrival date receive no refund unless property can be rented for the same dates and rental fee less a $250 cancellation fee. Rentals of 30 days or longer do NOT pay tax. 50% deposit to reserve; Total payment is due 60 days before arrival date. Security deposit will be refunded 14 days after departure date unless there is unusual damage or breakage.